For Tesla Motors founder Martin Eberhard, getting news of his ouster was like glancing at the review mirror and seeing one of his electric Roadster supercars approaching at 130 miles an hour without a sound. In other words, he was blindsided. “Somebody in the company asked me if I would be leaving at a certain date and I said, `I don’t think so,’ but that turned out to be the case,” Eberhard told Fortune’s Green Wombat. The date was last Friday and Tesla left Eberhard by the side of the road just months before the Silicon Valley electric car company rolls its hotly-anticipated Roadster off the production line and into the hands of celebrity customers like the Google founders and California Governor Arnold Schwarzenegger. Green Wombat spoke to Eberhard and Tesla chairman Elon Musk Monday afternoon about the changes at Tesla and the company’s plans for the future. Eberhard, long the public face of Tesla, stepped down as president of technology and gave up his board seat in a move that is — depending on who’s talking — either part of a planned transition or a hit-and-run take-out of the founder following the appointment of a new chief executive last week. The shakeup comes as Tesla wrestles with a transmission problem that has delayed production of the $100,000 all-electric car that does zero-to-60 in four seconds and can go 245 miles on a single charge. In August, Eberhard, who started Tesla five years ago with the financial backing of PayPal alum Musk, relinquished his CEO spot so the San Carlos, Calif., startup could hire a top executive with experience in large-scale manufacturing. Former Flextronics chief Michael Marks took over as interim CEO, but Eberhard says he never expected to be booted from the company. 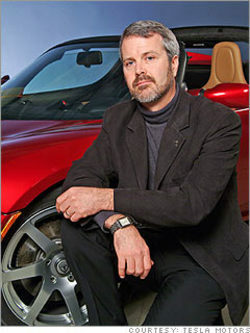 Some Tesla insiders tell Green Wombat they believe Eberhard’s departure is more the result of personality clash with Musk rather than the speed bumps Telsa has hit as it gears up to get the Roadster on the road to meet the expectations of the tech titans, Hollywood celebs and others who have have plunked down six figures for the car. Telsa put plans to sell electric car batteries to other manufacturers on hold while it focuses on the two-seater’s transmission, which hasn’t met the company’s durability standards. “It’s our biggest issue,” says Musk. “Unfortunately the company picked the wrong supplier, not once but twice, and now we’re on to our third. I feel pretty confident the way things are going but I personally had to take a hand in getting us there.” He says in recent months he’s spent up to a third of his time at Tesla. Musk offered a preview of what’s next for Tesla, saying that early next year the company will unveil its second model, a sports sedan code-named WhiteStar. Tesla also is developing a next-generation transmission, battery and drive train, which it expects to be production-ready in a couple years. “What we’re working on in the shop is a significant advance,” he claims. Rather than just sell batteries to other electric car manufacturers, Musk says Tesla aims to provide the complete drive train package — motor, transmission, battery and software. Eberhard says he’ll take a few months to figure out his next step. In the meantime, he still has his Roadster to look forward to. He’s No. 2 on the waiting list, right behind Musk. A very unexpected move from Musk. Eberhard might not be needed on Tesla’s point of view, but Musk’s role might change as well once the firm goes public. I hope Eberhard gets picked up by large car manufacturer… they could both benefit and create a new line, brand, or something even better, a platform for an industry. Great work Eberhard, we all owe you for your creativity and hard work. Elon Musk is a total sleazeball who is going to run Tesla into the ground. How can you fire the founder of the company before the official launch of the product? I could see afterwards if things were a complete failure, but Musk’s lust for power will be the undoing of the Tesla and electric cars in general. Musk has no passion for the business and ultimately the Tesla will go the way of the DeLorean. That is crazy. He was the face of Tesla. I was going to buy one, but no more. You cant sell the company without resistance from the founder. So in this new world you get rid of them. And collect money that isnt all yours made from the sweet and blood and dreams of others. Look what happens to people like evil kenevell (spelling?) hes dead and getting sued. This lacks class and grace on the part of Musk. At the least, show some respect to the person who has put in their heart and soul into the business. Am glad he got booted from Paypal. Only wish he had not been kicked out with his bag of gold. Douche-bag. To the guy who ‘didn’t see this coming’ I would point out that Elon Musk’s previous two business successes ended with him getting into arguments over who was in charge. At the same time, I don’t think he’s so dumb that he wants to hurt the company, and so, without benefit of any other information, it seems to me that there were differing views, and the guy with the money gets to call the shots. It’s still hard for me to feel any sorrow for Mr. Eberhard because he still stands to profit handsomely from this company, I would assume. I would still definitely buy one of these if I could afford to, especially since by the time mine would be ready, several hundred would have been manufactured and the problems worked out. Where is the rest of the board of Directors on this? I would really like to hear from Jim Marver, Laurie Yoler, Steve Westly, Ira Ehrenpreis, and Antonio J. Gracias. There is no need to hear from Kimbal Musk, Elon’s brother. Are they all just “Yes-men” to Elon Musk or do they really think that getting rid of Martin was in the best interest of the company? Are they going to sit by and let Elon take down the company or is there any chance they can band together and get control back? If they won’t or can’t band together, then why have a Board of Directors at all? A Board should direct not rubber stamp or even cower in the corner. They should really be ashamed of themselves. cest la vie. it’s heinous, but no worse than http://www.WarOnGreed.com right? I understand emotions are running high at this point in time but I think everyone should focus on the big picture. The success of Tesla Motors could usher in a new way of transportation technology that will alter our world for the better. Yes I am angry that Martin got such awful treatment but I know he will survive. Who knows, maybe he might even pull a “Steve Job” in the future. I just hope that this transition will not cloud the judgement of the die hard like me who just want to see this technology become mainstream. In any movement it’s important not to get too emotionally attached to one Messageer because they can get killed or disgraced. It’s always more important to be devoted to the idea. Let’s grow up, it’s all about money and the success of a very important technology, not just for cars, but for the well-being of this country. The only surprise is that anyone is surprised by Martin’s ouster from Tesla. The instant his funders decided to bring in a new CEO, this was the preordained outcome. Charismatic founders like Martin are the Pied Pipers for the best and brightest employees they attract, employees who will follow them to the ends of the earth… or off the edge of a cliff. Putting Martin in a Deep Space Parking Orbit called President of Technology was not enough to weaken the gravitational attraction to his troops. Mr. Drori now has their undivided attention which is what’s required. This was the startup equivalent of baseball’s “Purpose Pitch,” sometimes called a “brushback” that sends a message to the rest of the team about who’s in charge—it’s the pitcher. I’ve seen some attempts to compare this situation to Google’s founders who are still around, but that analogy breaks down. Google had a working business model and working product when the new CEO was brought in. Tesla has an interesting business model that can’t be considered “working” until they have a working product. It’s close, but it’s 3rd down and goal to go on the 2 yard line…they need to get the ball into the end zone. We should all hope they do. As implied in my first sentence, their success transcends itself (sounds like recursion). Electric vehicles have the potential to become the “Killer App” (http://geopoliticsofenergy.blogspot.com/2007/10/10252007-next-internet.html) in what I call an Electric Economy…a green Electric Economy that will alleviate much of what ails this country…and other countries. Tesla has been the inspiration for the Chevy Volt and one of the inspirations for my book (http://www.deadlyfreedom.com). It may seem ironic that the Achilles heel in an EV is something mechanical like a transmission. But after some thought, all that torque the motor generates has to be transferred to the wheels through the drivetrain. The weakest link in the drivetrain seems to be the transmission that gets slammed constantly since the max torque curve is constant for a long range of RPMs. It then gets slammed in the other direction when you lift your foot from the accelerator causing regen braking to occur. Since the car is really a computer on wheels I suspect they could alleviate some of those stresses with a software mod…at the cost of some performance. Startups are very much like our pioneers. Some made it to the gold fields of California while others died in the mountains… Wagons Ho! Attempting to take a company public is the sole reason to eliminate the founder from the company. My brother is an attorney who helps companies do IPOs. He said the first thing a new CEO does is eliminate all the executives who expect potential stock options. The CEO then scoops up all the potential stock options for himself and begins talking up the future company direction, strategy, and revenue streams. I believe Tesla is doomed within 3-4 years after this IPO. Tesla doesn’t have the manufacturing power to compete in the EV market once GM starts getting into full gear in about 5 years. I believe they can compete in the niche market they have created – building 100-1000 sport-cars/year, but Musk’s new strategy in mass-producing “EV shells” is completely unrealistic. “I think the right path for Tesla is as an independent company,” he says. “As soon as the timing is right we’ll take the company public and use that capital to fund additional product development. Or we can let put it in my pocket? I can just trash the founder, take his seat, go public and bail out on a golden parachute while the shareholders and workforce take the fall. Typical fire and forget corporate move and CEO greed that halts development and inovation. You can bet you bottom dollar that Musk wasnt there years ago putting in a late night working on the prototype. But you can bet that he will make big money over the founders fall. Tesla’s employee morale falls, deveopment slows as the product falls short of expectations. Company flounders for a few years until the big boys build a “real” cheaper electric car that lands the final blow to Tesla. Musk finds anothe scapegoat, pockets whatever $$ thats left and walks away the typical CEO hero. Point is todays CEO does not work for the company. They work for themself’s and the short term gain they pocket on the way out the door.